This little chap was found a few mornings back sheltering in the lee of a bucket of water we'd caught from a leaking hot water tank and reserved for flushing the loo. Water costs money in France and although we have a well the pump is considerably out of condition and the water too probably. 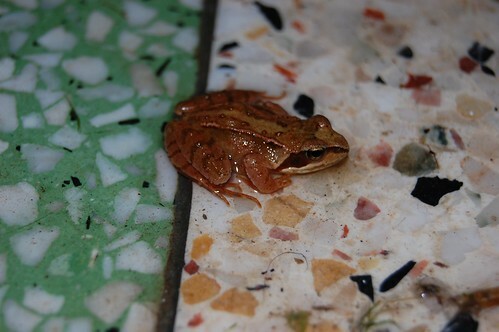 Anyway I digress, this frog was making the most of the damp indoors and was quite disgruntled when I evicted him/her. But what I can't work out is how they get in in the first place. I've been quiet for more than a while now. Some of it is to do with a broken routine, I've been in the UK and travelling around without access to my usual resources. I do now have the Aspire for mobile connectivity and jolly good it is, now that I've found out how to make it behave like a computer and not a nobbled games console. Still have issues with getting photos into it from the camera or phone without taking out cards, something I try to avoid doing since I invariably lose them. The tomato crop has been occupying a lot of my time. Why I ever hoped for a bumper crop is currently beyond me, I dream tomato pulp and I'm exhausted from making pickles, many of which I suspect will never be eaten. Just before I stopped blogging I had been planning a post about how lucky we are in France, We are having such a wonderful privileged time doing things that make us happy and without any stress at all. I still feel we are extraordinarily lucky but the words that I hoped to write have become mangled. I am a lucky person and I hope to share that with everyone again soon.